Traveler and archeologist; born 1812; died at Florence Jan. 6, 1882. He spent many years of his life in northern Africa, and for some years lived in an old Moorish palace about ten miles from Tunis. 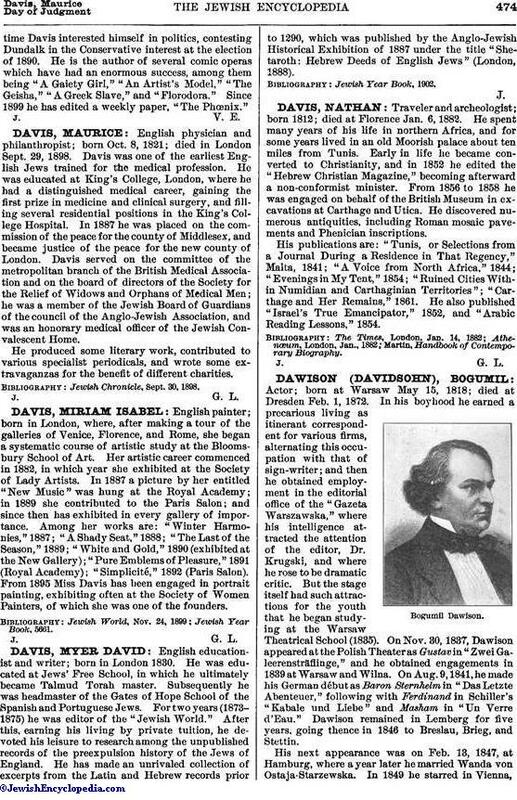 Early in life he became converted to Christianity, and in 1852 he edited the "Hebrew Christian Magazine," becoming afterward a non-conformist minister. From 1856 to 1858 he was engaged on behalf of the British Museum in excavations at Carthage and Utica. He discovered numerous antiquities, including Roman mosaic pavements and Phenician inscriptions. His publications are: "Tunis, or Selections from a Journal During a Residence in That Regency," Malta, 1841; "A Voice from North Africa," 1844; "Evenings in My Tent," 1854; "Ruined Cities Within Numidian and Carthaginian Territories"; "Carthage and Her Remains," 1861. He also published "Israel's True Emancipator," 1852, and "Arabic Reading Lessons," 1854. Martin, Handbook of Contemporary Biography.